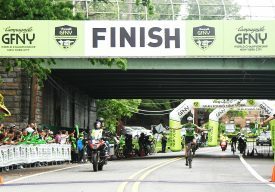 NEW YORK CITY, May 24, 2018 – Colombia and USA took home the overall wins at the 8th GFNY NYC World Championship where almost 5,000 riders from 95 countries lined up for the start on George Washington Bridge last Sunday, May 20. New York local, Mike Margarite from team Weather Channel (winner in 2016) made sure the men’s crown stayed in NYC. He took off with 800m to go to take the win. It was another NYC local, Bill Ash from Foundation Cycling who attacked from the gun. He worked hard creating a one-minute gap from the chasing peloton but crashed after 30k, losing his shot at the win. A chasing group that contained Luis Lemus (MEX) and 2017 winner Ricardo Pichetta (ITA) reeled in five leader riders at the top of Bear to form a group of 25 riders. The peloton stayed together until after Cheescote when Pichetta, Lemus, Margarite, Kevin Bouchard-Hall (USA) and Jurgen Moreels (BEL), GFNY Middle East-Africa Champion formed a five man breakaway. Five was reduced to three when Lemus pushed the pace on the State Line hill. The break included Lemus, Pichetta and Margarite. After some ground on Dyckman Hill, Lemus caught back up with 2k to go but he could not counter the attack made by Margarite with 800m to go. He held off Pichetta for the win in 4:22:23. There was no real surprise in the women’s race. With 2017 runner up Marcella Toldi (BRA) deciding not to race, there was little stopping Camila Cortes of Colombia riding away with her 5th World Championship title in 4:47:13. Right from the start she broke away from the women and crossed the line 6 minutes ahead of second place, American Jill Patterson (4:53:26) with Paola Monroy (COL) rounding up the podium a further 7 minutes back in 5:00:14. Cortes now holds an impressive 5 GFNY NYC Championship titles and 6 GFNY World wins. Can anyone stop her?